Sun Valley Resort will kick off its second annual Winter Wonderland Festival Saturday, Dec. 14, with treats, visits with Santa and a Classic Christmas Window Stroll in Sun Valley Village. The resort will host a free gingerbread house decorating workshop for children from 2-4 p.m. Saturday in the Boiler Room. Kids can have their photos taken with Santa Claus from 1-3 p.m. on the Boiler Room deck. From noon to 5 p.m., a food cart will offer holiday treats, hot cocoa, cookies and brownies. Kids can also take part in a scavenger hunt. Jack Sibbach, Sun Valley Resort public relations and marketing director, said most of the events taking place during the festival will be family-oriented. On Sunday, Dec. 15, children from the Girls on the Run program will offer free gift wrapping for donations at stores in the village. The festival will continue on Thursday, Dec. 19, with the “Glassybaby Trunk Show” at the lodge gift shop. Carolers will sing at various locations through Dec. 30. Dec. 21 and 22 will provide kids with their second opportunity to meet Santa, as “Breakfast with Santa” will take place in the Lodge Dining Room from 10 a.m. to 2 p.m. both days. 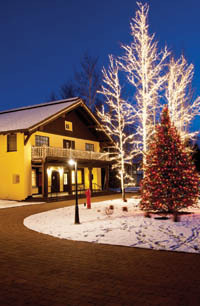 A Tree Lighting Ceremony is set for 5 p.m. Dec. 21 at the Sun Valley Inn. The sixth annual Classical Christmas Concert will take place at the Sun Valley Opera House at 7 p.m. Dec. 22. Sibbach said he is very excited for the “Nutcracker on Ice” show at the resort’s outdoor rink on Christmas Eve. The resort expects around 4,000 people to show up for the free event, which will include hot cocoa, cider and cookies for guests. The show is followed by the annual Torchlight Parade and fireworks. The Winter Wonderland Festival will wind down on Dec. 28 with the Ho-Ho Handrails and Holiday Ho-down event. The ski terrain park competition is set for 3-6:15 p.m. at Dollar Mountain, followed by the dance party from 6:15-8 p.m. Pizza, beer, wine and hot drinks will be available. The final event will be a Sunday champagne brunch on Dec. 29. Check www.sunvalley.com/holidays for a complete Winter Wonderland schedule.